Team Work Makes The Snapper Dream Work! 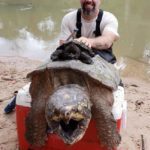 This past weekend, our TSA-North American Freshwater Turtle Research Group (TSA-NAFTRG) performed their regular sampling for our long-term population monitoring and species distribution assessment for Western Alligator Snapping Turtles (Macrochelys temminckii) in southeast Texas, and boy, was it a doozy! Volunteer scientist Chris Drake displays a young 5 lb. (2 kg) specimen atop a gargantuan 132 lb. (60 kg) male snapper. Joined by Dr. Day Ligon of Missouri State University and Dr. Denise Thompson, the team, led by Eric Munscher, captured, measured, weighed, took DNA samples, inserted unique identification tags, and released an astounding 19 alligator snappers over a two-day period. This included a 132 lb. (60 kg) leviathan; the largest male snapper that we have captured in Texas over our two years of monitoring! The 19 turtles represented a mix of male, female, and juvenile specimens; a demonstration of reproductive success and survivorship for this once overtly exploited turtle. At a recent workshop to address the status and conservation of the Alligator Snapping Turtle in Texas, the species was elevated to the state ranking of S2 (Imperiled), making our research into the distribution and ecology of this iconic State Threatened species all the more important. And you can help! Eric Munscher, Dr. Day Ligon, and Dr. Denise Thompson with a male snapper prior to its release. This research is performed by volunteer research scientists, TSA staff, is supported and permitted by Texas Parks and Wildlife Department (TPWD) and municipal parkland authorities, and is generously aided by the TPWD Conservation License Plate Grants program. If you are a Texas resident, please consider aiding our research and conservation of Alligator Snapping Turtles by switching to a Texas conservation license plate on your vehicle AND becoming a TSA member today! Together we can make the conservation dream work for the magnificent Alligator Snapping Turtle! if this helps I had 4 of these turtles as pets in the 60’s . the turtles were from sims bayous weighing from 96 lbs to 105 lbs .